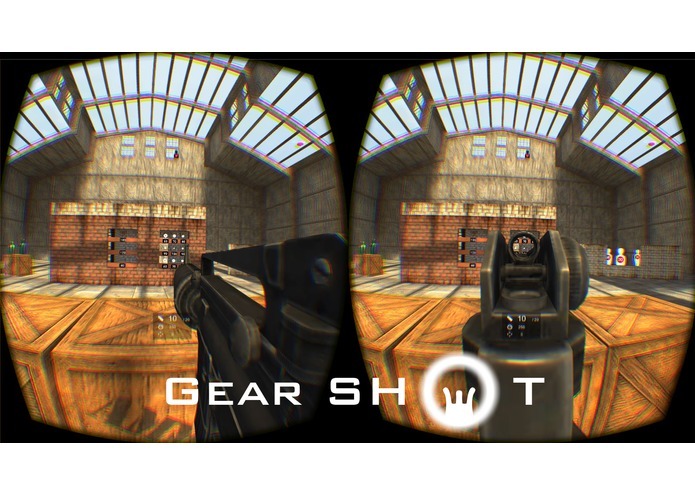 Virtual Reality aiming FPS distinguished from the games using traditional 2D like cross hair. Gaze & Game pad controller. Step 1. Search the target head tracking. Step 2. With one eye closed, put the rear sight of the gun close to the dominant eye. Step 3. Align the gun sight on target. Step 4. Take a deep breath, hold it and pull the trigger! 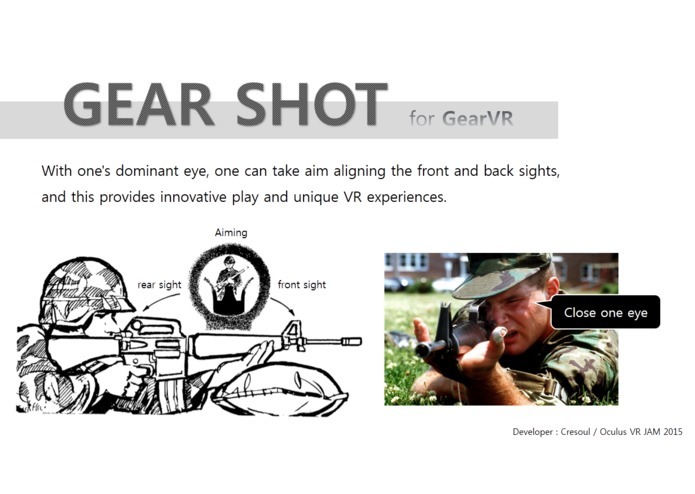 With one's dominant eye, one can take aim aligning the front and back sights, and this provides innovative play and unique VR experiences. Planning to develop various game modes on top of the basic system above in order to give players many choices for their own tastes. 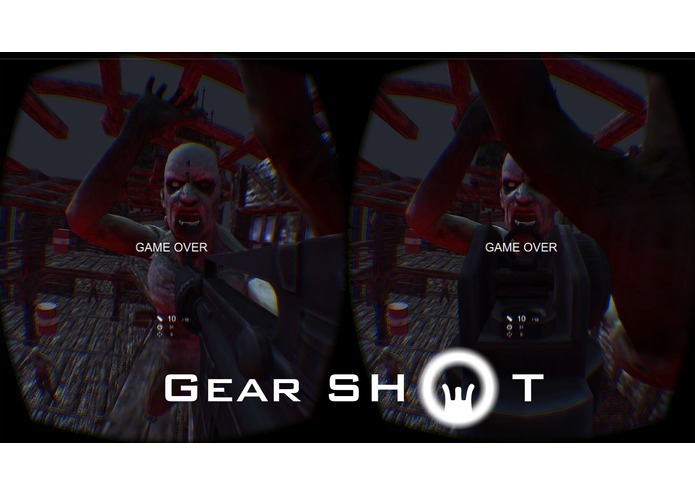 Each of the game modes has the game length of 5-10 minutes considered to be proper for VR. During the time, players can compete with each other for world rankings. Also planning to make this game realistic using with the aiming system, but not that realistic but somewhat casual for light gamers who don't know about VR or FPS Games, excluding complicated things like Ballistics. 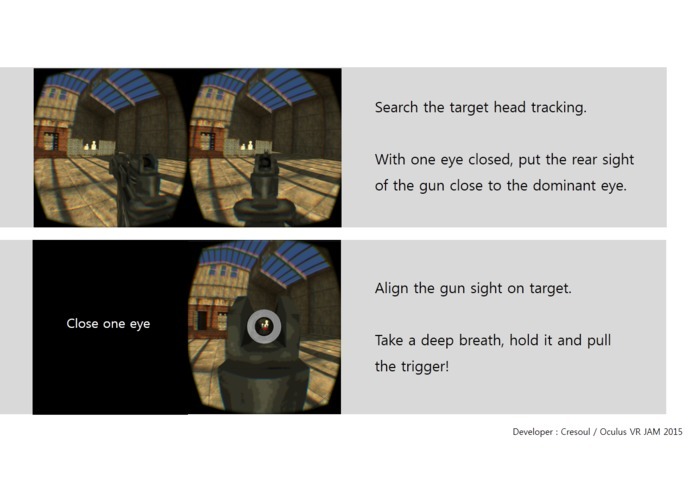 To reduce VR Sick and give comfort to players, shooting will be possible only in the fixed position. During the contest, three of game modes will be made. Tutorial : This includes an introduction to basic control systems and some simple missions. Shooting Range : With thirty given bullets, shoot various targets as many as possible to get a high score. Zombie House : With infinite bullets, shoot zombies to survive as long as possible. More game modes to be made after the contest. Sniper Mission : Save hostages in public places with a rifle. Stop the enemies before hostages are killed. Safari Hunter : Hunt flying birds and running animals in a car running. Multiplay Mode : Co-op, Team Battle, etc. Common factors in all games. Coins collected during the game can be used to purchase various guns. A player can experience the different feeling of guns, such as power, kick, scope. Also can upgrade the guns, throw grenades, do close combat(fist, war-knives, spears, weapons of every description). Items for HP, AMMO, time-stopping are provided during the game, and can be purchased in the item shop as well.